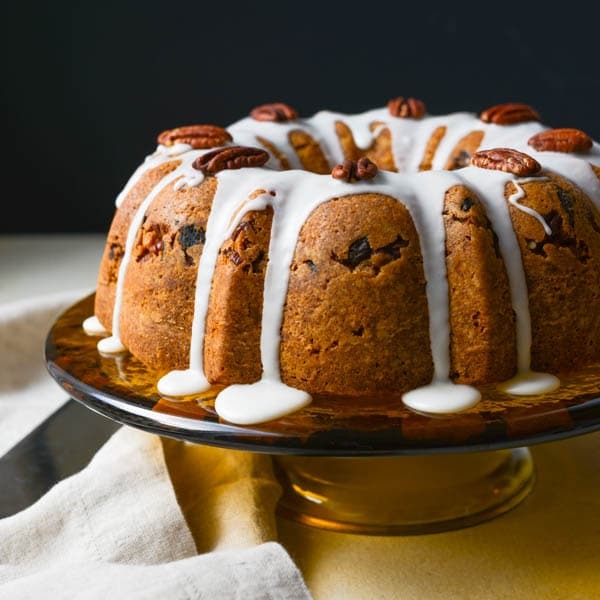 An easy bundt cake recipe with a tempting cinnamon spiced dried fruit and nut filling, this sour cream bundt cake is a family favorite. We like it for breakfast or brunch with a cup of coffee or as an afternoon snack. My glazed bundt cake is great for company too and travels well. 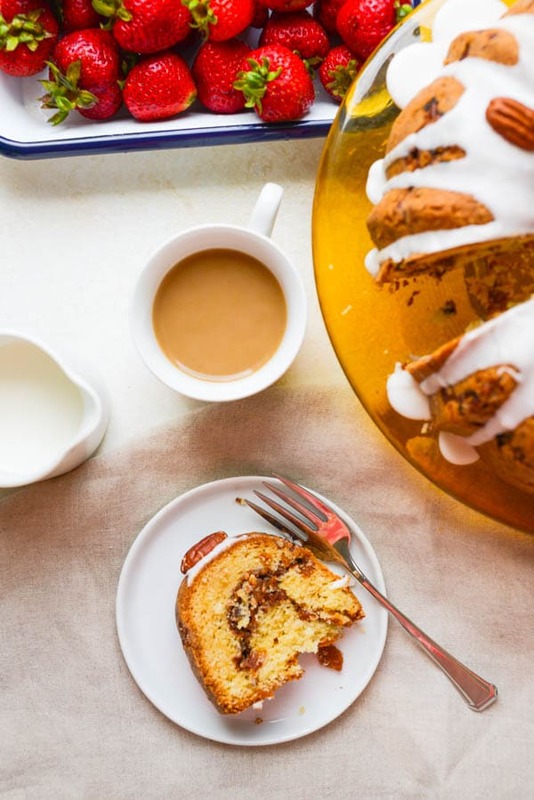 Everyone needs a good sour cream bundt cake in their repertoire and this easy bundt cake recipe is filled with a cinnamon-y fruit and nut center that can’t be beat. 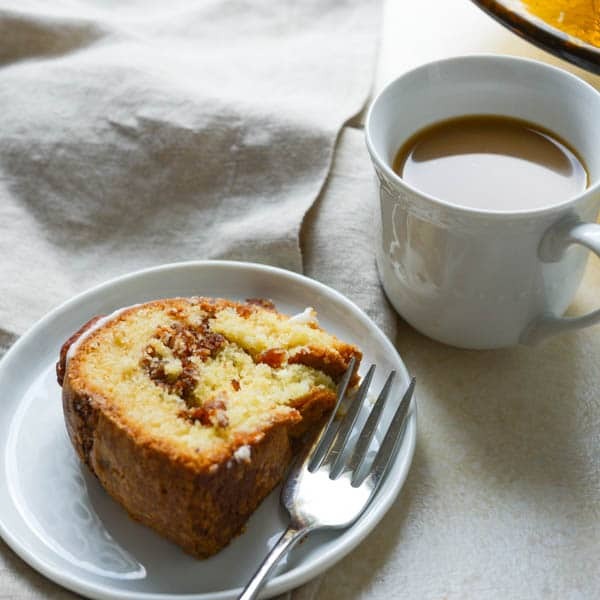 Best of all, it’s a glazed bundt cake, that’s equally good as a breakfast-time coffee cake, tasty afternoon snack or sweet finale to dinner with friends. 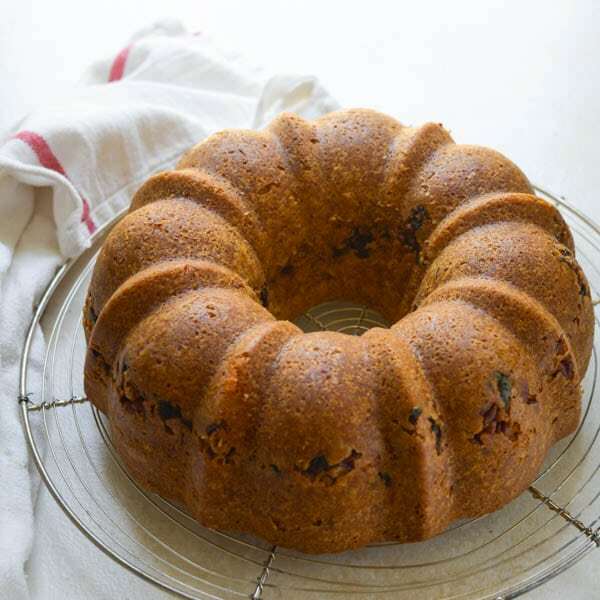 My easy bundt cake recipe starts with the fruit and nut filling. 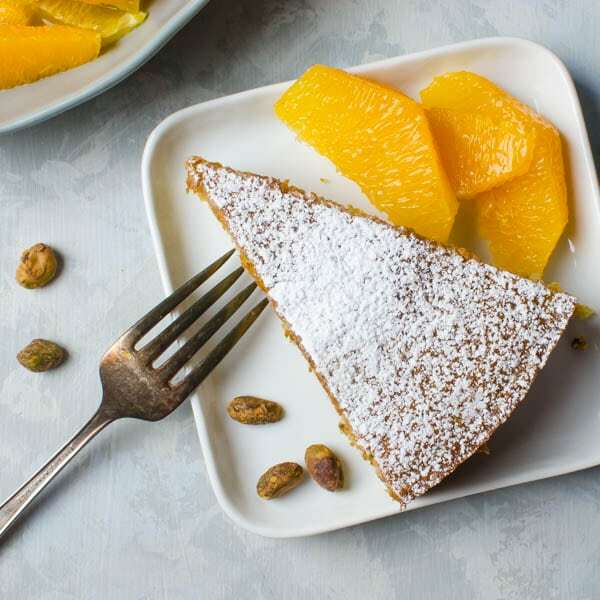 Dried apricots, chopped fine and toasted pecans are tossed with cinnamon sugar that will make a yummy surprise center in the cake. If you’ve ever done any baking, these steps will look familiar to you. 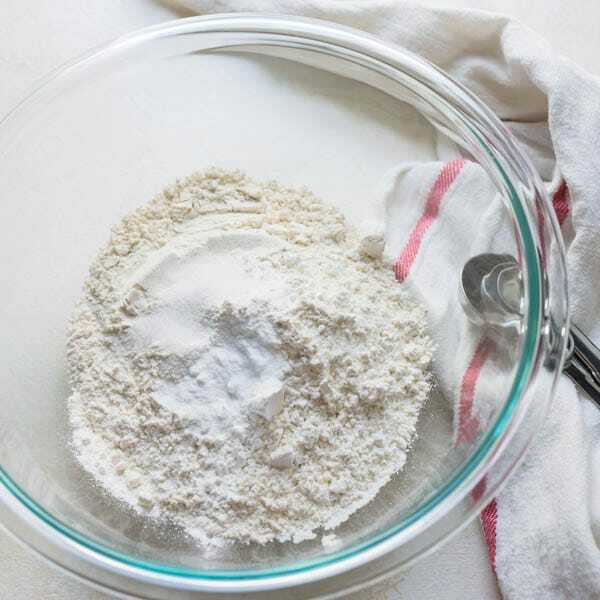 Add the dry ingredients (flour, sugar and baking powder) to a bowl and whisk to combine. Set aside the dry ingredients. Cream the butter and sugar together until light and fluffy and add the eggs one at a time. Then add the sour cream until it’s well blended. Add the flour mixture a little at a time until it’s all incorporated into the batter. I’ll be honest — I’ve never made this sour cream bundt cake without taking a good fingerful of the batter at this point. I know it’s frowned upon – raw eggs and flour and all…. 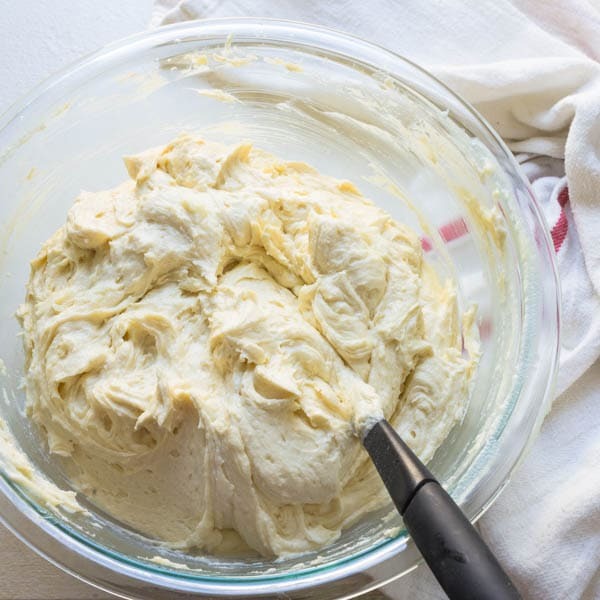 but come on… sour cream bundt cake batter… so good! 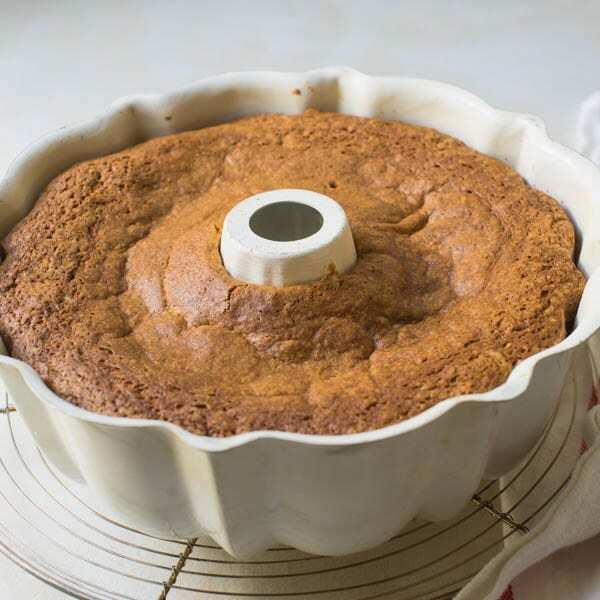 Spread 1/3 of the batter into a prepared bundt pan and top it with the apricot nut filling. Then smooth the remaining batter on top of the filling and bake. Cool the sour cream bundt cake in the pan set on a wire rack for about 20 minutes before turning it out onto the wire rack to cool completely. I think easy bundt cake recipes benefit from a little garnish. That could be something as simple as a dusting of powdered sugar or a full on frosting. But my favorite is an easy powdered sugar and cream glaze. Use about one and a half cups of sugar with one to two tablespoons of cream or half and half and stir until smooth. Spoon the glaze over the cooled bundt cake. Isn’t that beautiful? 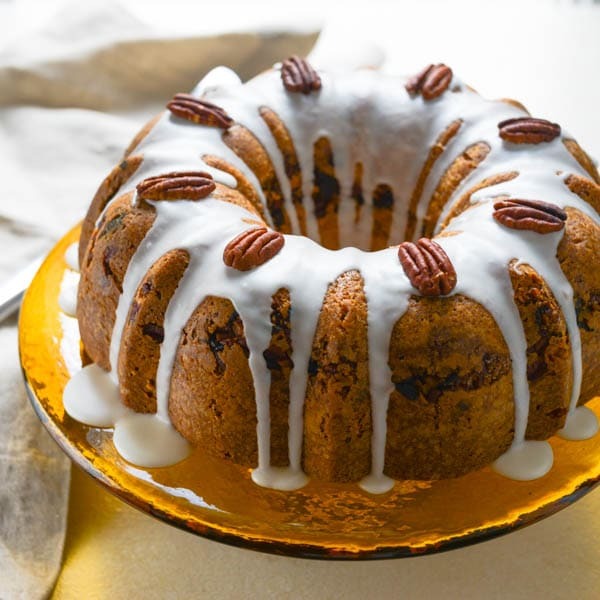 I like to top it with whole toasted pecans — and if I’d had any dried apricots left, I would have chopped and sprinkled more on top to give a sense of what this glazed bundt cake is really about. I guess we’ll just have to imagine how good that would look. 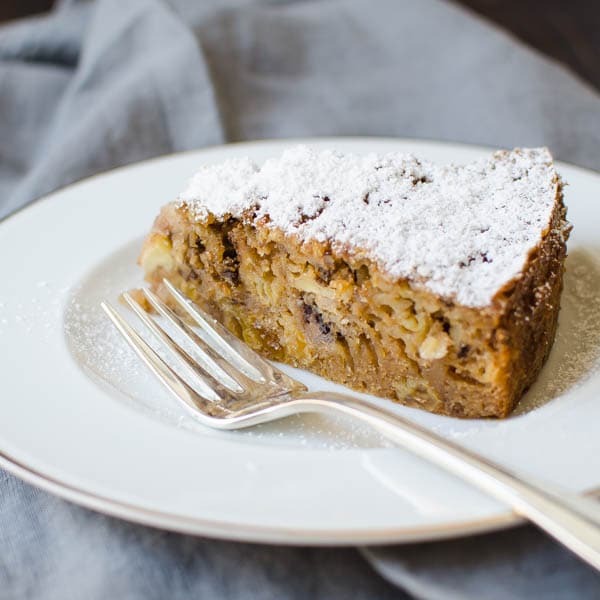 A nutty, moist coffee cake with bits of dried apricot, perfect for brunching or snacking. Preheat the oven to 350°. 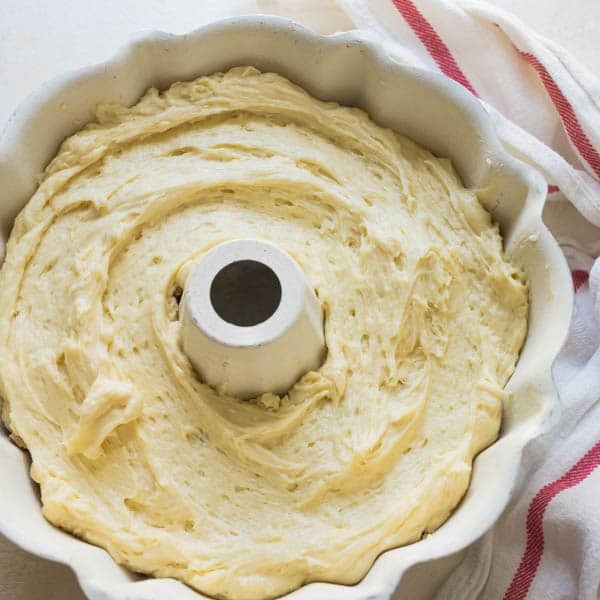 Generously butter and flour a 10" bundt pan. Set aside. Place the pecans on a baking sheet and toast for 10 minutes in the oven until fragrant and browned. Transfer the nuts to a cutting board and chop them finely. 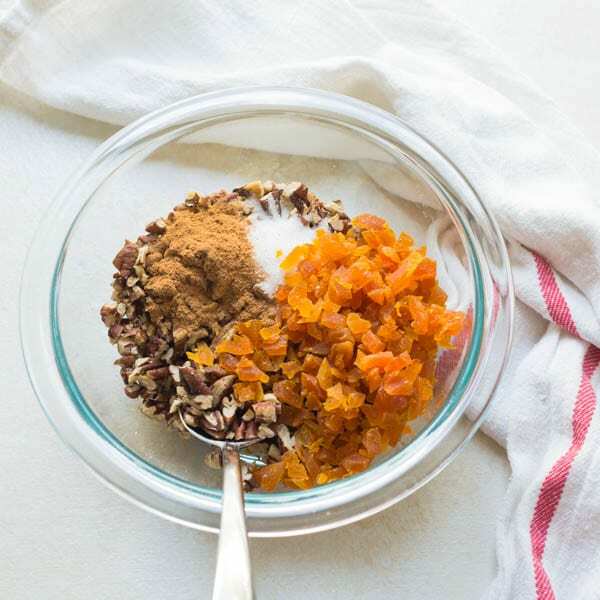 Add the chopped pecans, 1 tablespoon of sugar, cinnamon and dried apricots to a small bowl. Toss until well combined. Set aside. In a large bowl, combine the room temperature butter and remaining 1 3/4 cups sugar. Beat until light and fluffy. 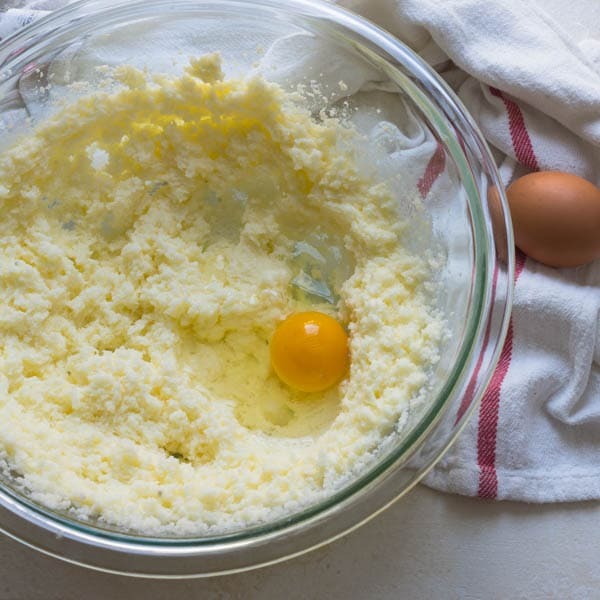 Add eggs one at a time, beating them thoroughly into the butter mixture after each addition. Add the sour cream and vanilla to the butter mixture and beat to combine. Add the flour mixture into the butter mixture in three additions. Mix until just combined, don't over beat. Spread 1/3 of the batter into the bottom of the prepared bundt pan. Sprinkle with the nut and apricot mixture. Top with the remaining batter and smooth with a spatula. 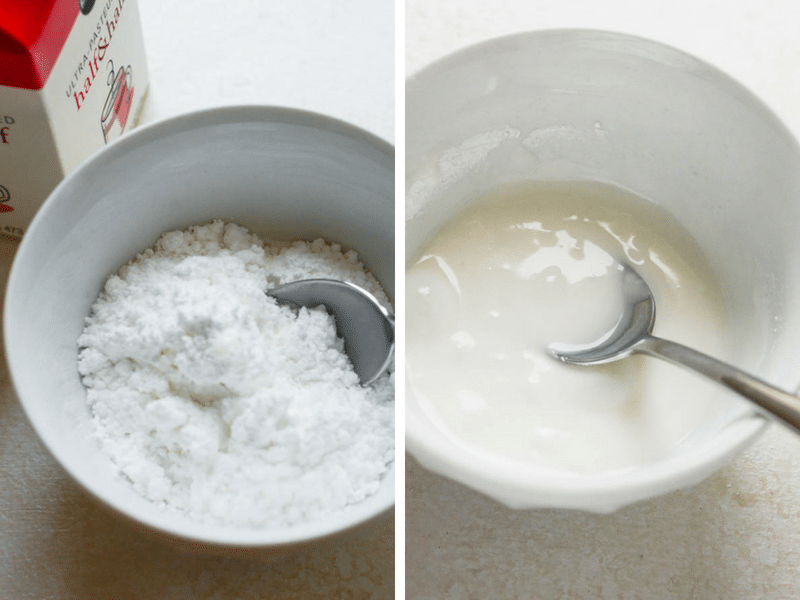 In a small bowl combine the powdered sugar with the cream or half and half and stir until smooth. Spoon the glaze over the cooled caked and let it run down the sides. 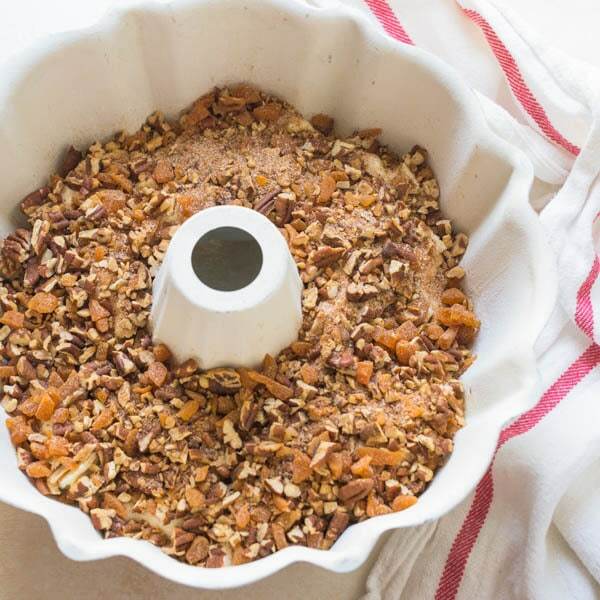 For an extra touch, crown the cake with additional toasted pecans and/or chopped apricots. Yay! I totally understand!!! Thanks so much! This sounds and looks delicious! I’m just wondering about what glaze you used, I don’t seer it in tut rector. Thanks for all your yummy recipes! Thanks for the heads up, Marsha. That’s what happens when you’ve got 10 things going at once. I’ve included the glaze in the recipe. 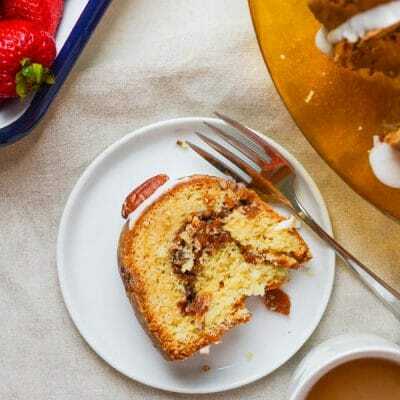 I love a good bundt cake and this looks good! Thanks, Katrina – If I’d known, I’d have sent you home with some the other night! What a beautiful bake! I love the combination and that’s my favorite too..so can’t wait to try it! What a gorgeous cake!! I love the apricots in here too. Sounds like a good excuse to me — obviously cut back on the cooking time if they’re mini cakes! 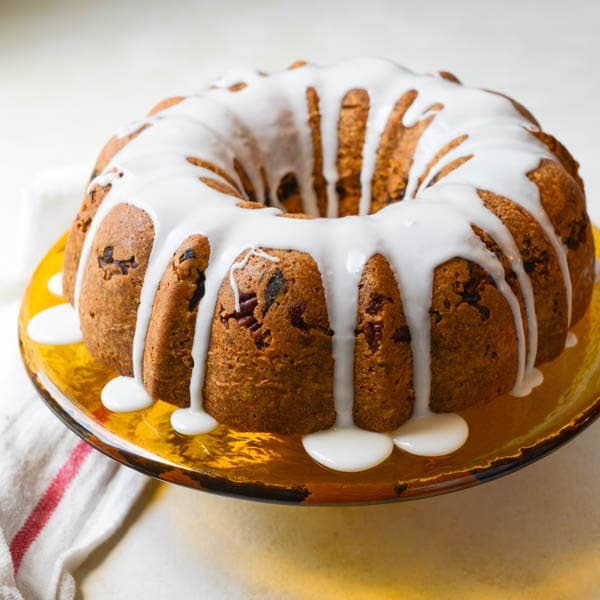 Fruit and nut filling in this gorgeous bundt cake has my heart. I’m totally pinning this. Cake looks amazing! We have the same approach to eating (mostly healthy with an occasional treat) I shared this coffee cake at our monthly blogger meet up — the ladies enjoyed it. What a beautiful cake! 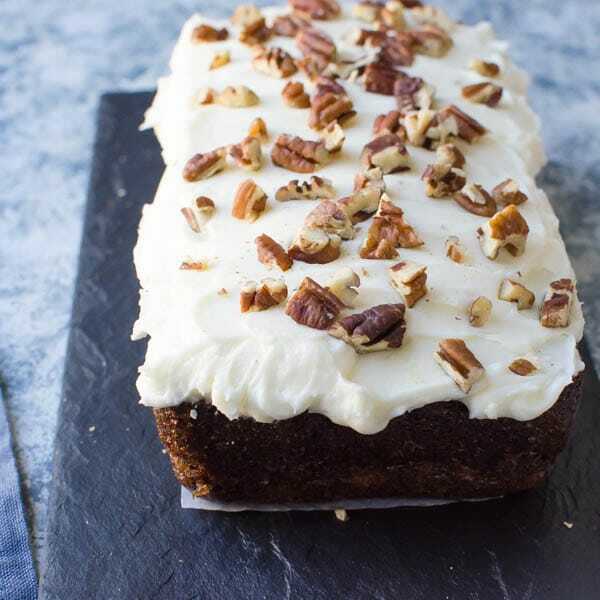 The spices in this have me dreaming of fall now, and with the temps reaching 100 today in Kansas, I’m ready for fall and for this cake! I can’t wait to make this, thank you for sharing!